Geekster on Movies is a blog of movie capsule reviews that began in 2001. The blog uses a four star rating system. The lowest rating is "BOMB", followed by one and a half stars, rising in half-star increments to a maximum of the coveted four stars. The only exceptions are two mysterious films, which are rated with three and one quarter stars out of four. Made-for-television films and television series are also included, however the Geekster only reviews ended/finished series so the capsule is viewing the show as a whole. 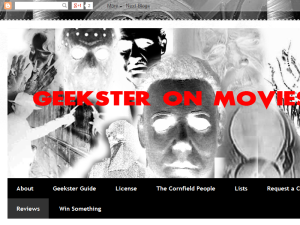 This what your Geekster on Movies Blog Ad will look like to visitors! Of course you will want to use keywords and ad targeting to get the most out of your ad campaign! So purchase an ad space today before there all gone! If you are the owner of Geekster on Movies, or someone who enjoys this blog why not upgrade it to a Featured Listing or Permanent Listing?